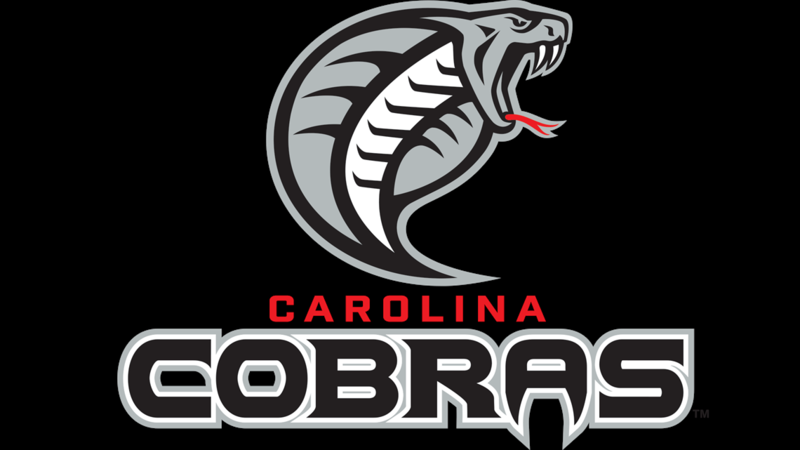 The Carolina Cobras started the road to defending their National Arena League championship on the road as they took on the 2018 regular season champions the Massachusetts Pirates at the DCU Center in Worcester, Massachusetts. The defending Champs put on a show defeating the Pirates 54-22 With Quarterback Charles McCullum throwing 23 of 25 for 248 yards and six passing touchdowns. The Cobras and Pirates traded touchdowns on each teams opening possessions with a one yard touchdown run by Carolina’s fullback Dashawn Johnson, and a four yard touchdown by Pirate’s fullback Quayvon Hicks. A 7-6 lead for the Pirates over the Cobras as kicker Nick Belcher missed the point after on the visitors scoring drive. Joe Morrow, a new addition this year for Carolina, earned his keep quickly by getting the second score of the night for Carolina as he went 17 yards and diving over the end zone wall for a touchdown reception with Belcher atoning for his previous miss by recovering a botched snap and nailing a two point drop kick through the uprights. The small victory was quickly forgotten when the Pirates found a soft spot in the Cobras coverage and sent Mardy Gilyard to the end zone with ball in hand. After the Pirates next drive ended with a interception in the end zone by Carolina defensive back Michael Green and a stalled Cobras one ending in a missed 43 yard field goal Carolina was the next team to successfully move the ball down the field with help from quarterback Charles McCullum finding a combination of wide receivers Fabian Guerra and Zack Ducker. It was then the fullback Johnson finding the end zone for the second time of the evening. The score 20-14 as Belcher similarly missed the extra point after the fullback rush. A Pair of scoreless drives from the two teams and one more touchdown from McCullum to veteran receiver Jordan Jolly ended the first half of the opening night of NAL action 27-14 in favor of Carolina. After the halftime break, the Pirates drove the ball deep but turned it over to the Cobras five yards shy of scoring. This time Guerra was on the receiving end of McCullum’s pass to the end zone to make it 33-14 after another botched snap on the extra point. Belcher again compensated with a two point deuce on the kickoff to make it 35-14. The tank began running low for Massachusetts as their quarterback Sean Brackett was picked off at their own nine yard line by the linebacker for Carolina Ken Walton. McCullum capitalized on the turnover by finding Jolly open in the end zone to bolster their lead 41-14 as Belcher continued to struggle with the point after try. The Pirates again were snuffed by the Cobras defense and turned over the ball. Carolina punished them for it swiftly to the tune of a 34 yard touchdown bomb to Guerra, Belchers kick rang positive for a score of 48-14. A deep kick return looked to give life to the pirates but against the drive stalled. That matched with a Carolina turnover to give Massachusetts another chance to score with Gilyard once more. Combined with a kickoff deuce by Tyler Rausa for Massachusetts left the Pirates trailing 48-22. Carolina drove down the 45 yards of the field to score with the McCullum-Jolly connection again, this time from 18 yards out. Continuing the theme of the evening Belchers kick sailed wide of the uprights and ended the scoring for the night with three minutes left in the fourth quarter.